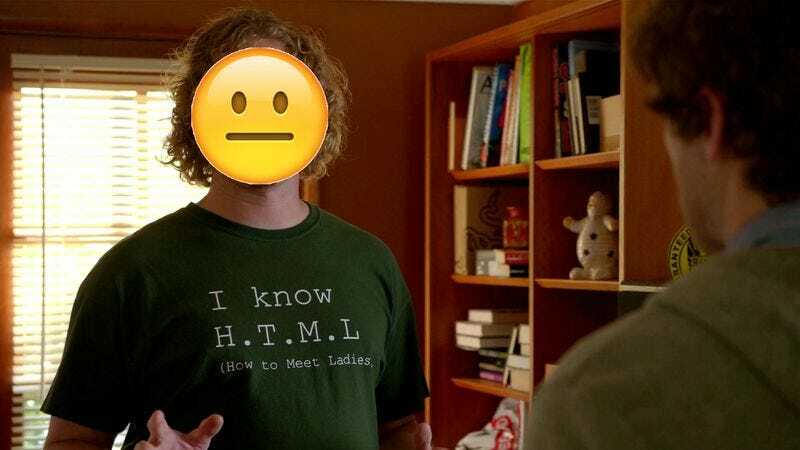 People seem to like T.J. Miller, the guy who plays the perpetually stoned and relatively business savvy Erlich Bachman of HBO’s Silicon Valley, but would he be as likable if he were just a little face inside your phone? That question will finally be answered by Sony’s Emoji Movie, which will star Miller and is also still a real thing that is definitely happening and not an awful dream. Sony Animation announced the news on its Twitter account with a fun video of Miller recreating some famous emoji, and Entertainment Weekly expanded on that announcement by revealing that Miller will be playing a character named Gene who is the son of two “meh” emoji (let’s not try to unpack that). However, unlike his parents, Gene isn’t a “meh” emoji. He was “born with a glitch” that causes him to feel “multiple expressions.” Naturally, he eventually goes on an adventure to try and find his proper place in the world. In other words, it’s Wreck-It Ralph, but with jokes about phones instead of jokes about arcade games—a comparison we already made back in April. Of course, while that movie had cameos from a bunch of beloved video game characters, this one can include appearances from iconic little shapes like the poop emoji, the crying face, or—as one of those great jokes that only adults will get—the eggplant.